Opening the More Functions window gives you access to some advanced playback features such as See-It-All, Snapshot and Next Angle. To display the More Functions window, click and then click to view all the available buttons. Use to navigate through the disc menu. Same as the corresponding colored button on the remote control. Displayed for Blu-ray Discs only. Repeats the last dialog. See Say-It-Again. Captures video content as an image file. (Not supported during Blu-ray Disc playback.) See Capturing Frames From Your Favorite Scenes. Switches among any available angles. See Next Angle. Select to display or hide buttons by expanding or collapsing the window. Activates See-It-All function. See See-It-All. Switches among karaoke modes. See Playing a Karaoke Disc. AB Repeat is a customizable repeat function that lets you select any part of the movie for repeated playback. The starting point of the repeating playback is called A and the end is called B. This is different from Say It Again, which only repeats the current dialog. During playback, set point A by clicking the button at the beginning of the segment you would like to repeat. Click again to set point B, or where you would like the segment to end. The segment will repeat and loop continuously. To cancel AB Repeat, click the button again or navigate out of the segment’s range (i.e. with the navigational slider or jumping to the next or previous chapters). Note: this feature is not supported with Blu-ray Disc Java (BD-J) titles. Simply click the button during the playback of a dialog to repeat the same dialog again. Click again to turn Say-It-Again off. CyberLink PowerDVD lets you capture individual frames from your favorite scenes during the playback of a DVD. Note: this feature is disabled during the playback of Blu-ray Disc titles and DVDs in 3D mode. CyberLink PowerDVD lets you select your desired capture type and size quickly and conveniently before you are ready to capture a frame. Note: more capture options, including setting capture format and custom size, are available within Player Settings. See Capture for more information. During the playback of video content, click on the button on the playback controls and then on to display all the options. Right-click on the button to display the capture options. Capture to Clipboard: select this option to capture the image to your clipboard, which you can then manually paste to another program. Capture as File: select this option to capture the image as a file in the specified format to a folder on your computer. To set the capture folder and the file format, see Capture. Capture as Wallpaper (Center): select this option to set the captured image as centered background wallpaper on your computer’s desktop. Capture as Wallpaper (Tile): select this option to set the captured image as tiled background wallpaper on your computer’s desktop. Original Video Source Size: select this option to capture the image at the size of the original video, e.g. 720X480 or 720X576 for most DVD titles. Current Video Window Size: select this option to capture the image at the same size you are currently viewing it at. Custom Size: select this option to capture images in the customized size specified on the Capture tab in the Settings window. During playback, click the button in the More Functions window or press C on your keyboard to capture a frame of the current video content. To be more precise, you may pause the scene, play it in slow motion, or step frame, and then capture the exact desired frame of video. This feature has not gained prominence as of yet among disc authors, but is available on occasion for music concert discs. Click during playback to switch among available angles. See-It-All helps ensure that you are able to watch an entire movie by calculating the notebook’s battery life versus the movie’s remaining time length, and adjusts the movie’s playback speed accordingly. 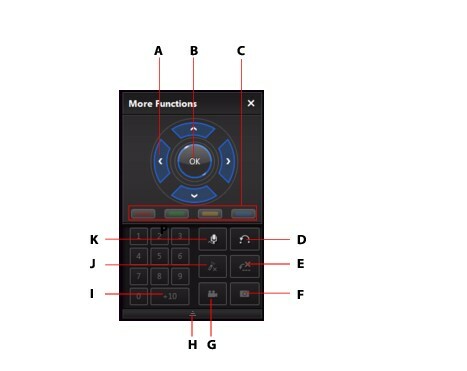 The Menu/Number pad offers navigation buttons, a pad for entering numbers, and buttons for accessing other functions. Like any stereo’s remote control, use the number pad to directly input the specific track you would like to play when listening to a playlist or an audio CD.